LostWinds 2 is on its way to the land of the rising sun! The LostWinds WiiWare games from Frontier have gotten loads of praise around the gaming industry and are two of the strongest selling titles on WiiWare. Noteworthy for containing boatloads of character, great design and compelling play mechanics which take advantage of the unique capabilities of the Wii remote, we cannot recommend them enough. Square Enix published the first Lost Winds title last December, and they seem to be sufficiently impressed to publish the second part next week. Congratulations to Frontier with their success as the flag-bearer for quality platforming on WiiWare! Square Enix to Publish LostWinds: Winter of the Melodias in Japan Partnership brings the Season Switching “Best WiiWare Game of 2009” to Asia. 18th December 2009. Frontier Developments, one of the games industry’s leading independent developers, is delighted to announce a further partnership with Square Enix to publish ’the best WiiWare game of 2009’ (IGN) LostWinds®: Winter of the Melodias in Japan and Asia. Illustrating the widespread acknowledgement of the game as one of the better Wii titles - disc or download - LostWinds: Winter of the Melodias was rated as No.8 in the Metacritic* chart of Wii titles for the year and is the onlyWiiWare game to feature in the Top 10 alongside established franchises like Tiger Woods, Guitar Hero and Metroid Prime. 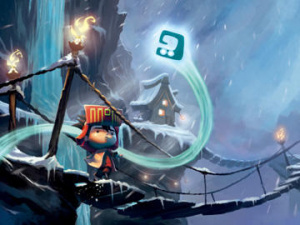 Influential IGN.com also voted LostWinds: Winter of the Melodias as the the best WiiWare game of 2009 for the Nintendo Wii, describing the game’s use of the Wii Remote as ‘masterful’. Hooray for the Happy Jappy Chappies. I hope it appeals to japanese gamers and does very well in sales. I definitely see this game catching on in Japan. Maybe this will change their perception that Americans can't make good games. why do Square Enix have to publish it when it's on Wii Ware? Why does it need a publisher at all for that matter? I thought the whole point of WiiWare was to remove the publisher from the process? I imagine the publisher here does the same as for a physical product - handle the nitty gritty on contracts, agreements, licensing and communications. Wow. That's really good for Frontier, getting published by Square. Enjoy, Japan. Prestigious! Good for Frontier, and well deserved. @SmaMan: This game was made in Britain. I'm thinking they help a lot with localization/translation. Oh... whoops! Dang, usually I get this information right... Still, getting a big name like Squeenix to publish you, that's bound to turn some heads over there.